Repeat after me: corned beef, rye, mustard. 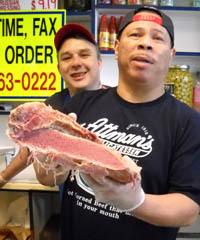 The legendary Attman’s Delicatessen has been a local institution, serving up some of the best corned beef charm city has to offer for nearly a century now – with no signs of slowing down despite a bum economy. I lived in east Baltimore for about two years and used to love going to this place. I must have gone fifty times at least. The cliche’ amongst deli-lovers is “well, the pastrami is good, but it’s not KATZ’ good”. Well, first of all, here’s a little secret: the best pastrami in New York isn’t at Katz’. It’s not even in Manhattan, it’s in Brooklyn. 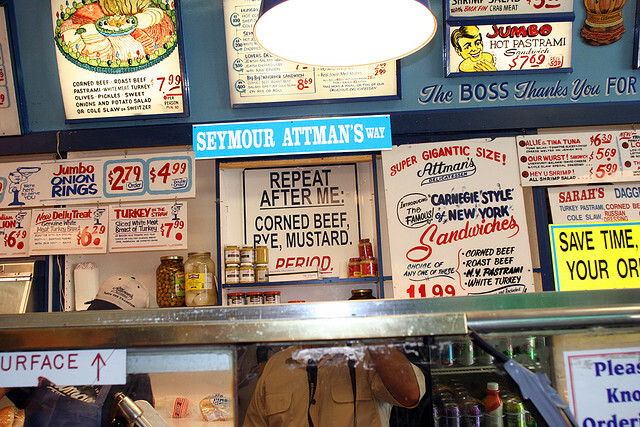 But that’s beside the point, because at Attman’s I really don’t go for the pastrami – I go for the corned beef. 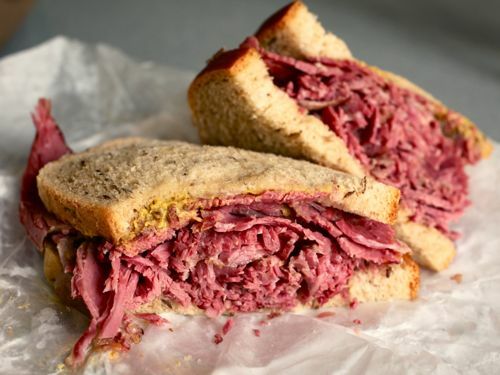 The warm, buttery, tender corned beef sliced so thin it melts in your mouth. Slap that stuff on a piece of rye bread with some of their signature mustard and, as Emeril would say, BAM!! By the way, is that guy even around anymore? Another great thing about Attman’s is the service. The same guys have been working there for as long as I can remember (which is only 6 years or so, but that’s still a long time to be employed at one single Deli). Their faces are so recognizable to me (and vice versa), and so are their personalities. Take Bob. Bob, and I’m not even sure if that’s his real name, has long hair and a lazy eye. Bob loves to hand out samples of his corned beef to everyone waiting in line – as if the smell weren’t already reason enough to order it. Bob also loves to crack hilariously dirty jokes, but he saves them for the end of the day so for an extra treat, show up around 6:25. 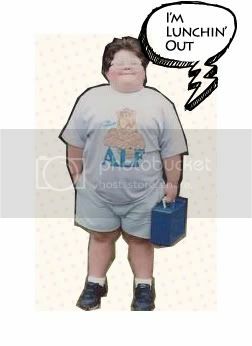 And who wouldn’t recognize this guy if they saw him on the street? As far as local legends go, there's Cal, Johnny, Edgar, and this guy. Back to the food. 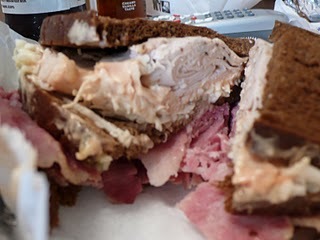 Attman’s has other sandwiches too if you’re looking for more than just corned beef. They’re all good but my favorite is the “Sarah’s Dagger” – turkey breast cured with a pastrami coating, corned beef, cole slaw, and russian dressing. It’s incredible and it’s enormous. Really trying to fill a void? Try the double decker Sarah's Dagger. I honestly don’t know enough to recommend some of their other menu items (ribs?? ), so your best bet is to stick with the winners: corned beef, pastrami, hot dogs. Oh yes, hot dogs. They have some of the best hot dogs in Baltimore. Great snap to them, spicy and full of flavor. A local bakery known simply as “Berger’s” has been churning out their famous cookie for so long that they have literally become ancient artifacts – no joke. 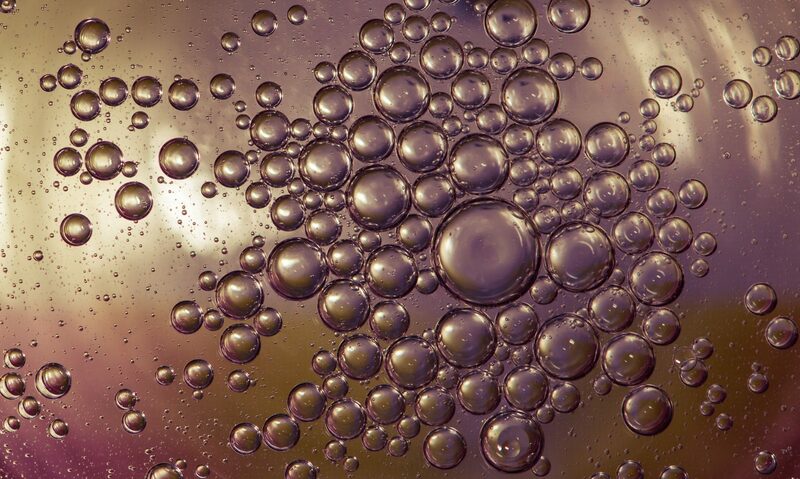 The problem is, buy them from your local chain grocery store and they may actually taste and feel like ancient artifacts. BUT, purchase them from the Berger’s bakery housed in Lexington Market and you’ll find thick, golden, buttery cookies topped with a sizable swirl of some of the best chocolate topping a vanilla cookie has ever come in direct contact with. Yes, you can see where I am going with this. Only at Attman’s (and Berger’s) can you find these puppies. 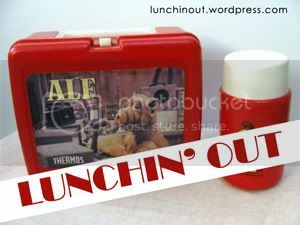 And at 75 cents a pop, you can order two or hey, how about three?? Bring some home with you. Give em’ to mom. Give em’ to pops. Give em’ to your dog, I don’t care. All mammals deserve a chance to partake in the awesomeness that is Berger’s original chocolate tops. And please, thank me when you’re finished. Tip from the expert: call in your order ahead of time and skip the never ending line at the counter.